Last month, Governor Cuomo and the Legislature reached an agreement on the state’s $140 billion spending plan. In addition to ethics and education reforms, the final budget includes long-sought reforms to the state’s Brownfield Cleanup Program, as well as provisions requiring more transparency of NYSERDA’s spending practices. The final budget also allocates the state’s $5.4 billion surplus. This surplus stems from recent subprime mortgage-related settlements reached with several financial institutions. The money will be spent on a variety of items including $150M for disaster preparedness and counterterrorism. A significant portion of the settlement funds is dedicated to infrastructure projects including $750M for the Metropolitan Transportation Authority (MTA), $200M for water infrastructure repair and replacement, and $100M for the New York City Housing Authority (NYCHA). The state Brownfield Cleanup Program (BCP) provides tax credits to developers working with contaminated former industrial properties. Despite many successes, the program has been criticized for providing tax credits to residential and hotel projects downstate that would have gone forward without the credits. The Governor and Legislature have been negotiating a comprehensive reform of the program for several years. The final agreement includes a ten-year extender of the program, as well as reforms to certain tax credits and a streamlined “BCP-EZ” program. BCP-EZ is a fast-track option that provides a liability release without tax credits. In the past the Legislature and other stakeholders have been critical of NYSERDA’s spending of the hundreds of millions of dollars collected through RPS, SBC, and RGGI. To address the Legislature’s concerns, the final agreement imposes new reporting requirements on NYSERDA in an effort to increase transparency. The authority must report to the Governor and Legislature, as well as publish on its website, information regarding all monies it collects and programs it administers. 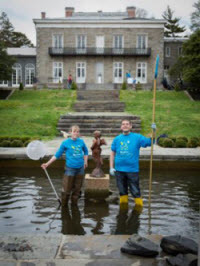 April 12-18 is National Volunteer Week. Volunteer week is about inspiring, recognizing and encouraging people to seek out imaginative ways to engage their communities. Con Edison has long held a tradition of contributing to and maintaining the social, cultural, and economic vitality of the communities our company serves. Our volunteer program offers employees, retirees and their families the opportunity to participate in diverse and innovative activities to improve the quality of life in the communities we work in and many of us also live in. National Volunteer Week was established in 1974 and has grown exponentially each year, with thousands of volunteer projects and recognition events scheduled throughout the week. Each year hundreds of Con Edison employees donate thousands of hours of service harvesting vegetables, serving meals to the homeless and seniors, and mentoring students. Be sure to check out Con Edison’s volunteer website for your opportunity to give back this month. This year marks the 10th year Con Edison has supported Solar One, a nonprofit organization that changes the way people think about energy, sustainability, and resilience by engaging and educating a diverse set of stakeholders and beneficiaries. Con Edison was a founding supporter of Solar One’s Green Design Lab (GDL) curriculum. GDL is an on-site, hands-on environmental literacy and STEM education program that aims to promote behavioral changes in the direction of energy efficiency and healthier, greener urban spaces. It is the only program of its kind in public schools that looks at the school building as both a laboratory for learning and a tool for environmental change. The program began in 2010 in just 10 schools. In 2014 GDL was delivered to more than 1,500 NYC students and 40 teachers. Beyond being valuable to students and teachers, GDL serves as an essential component in New York City’s plan to reduce greenhouse gas emissions 80% by 2050. An important success point of the partnership is student feedback at the conclusion of the unit. When asked if they perceive themselves as being able to contribute to solving energy problems by making appropriate energy-related choices and actions, 95% of middle and high school students who receive the GDL energy unit responded with yes. Some even credit the program with creating greater awareness of their own interests and career opportunities. 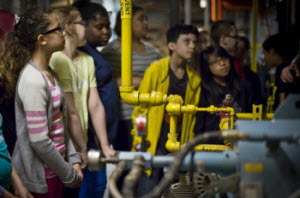 Recently, one New York high school student said “the electricity project making light was the most exciting. This made me consider studying engineering”. In addition to philanthropic support, Kathy Boden, Vice President of Gas Operations, serves on Solar One’s board of directors. Our partnership with Solar One exemplifies Con Edison’s commitment to energy education and STEM. Solar One is also active in providing curriculum and education support to Con Edison’s partner school, Energy Tech, in Queens. Be sure to check out the spring volunteer opportunities throughout our service territory. Garden clean-ups are taking place in the Bronx, Brooklyn and Westchester. Get more information on opportunities through the volunteer website. Or email powerofgiving@coned.com with any questions.